Last November, Clearwater and Central Highlands Water partnered to coordinate a successful integrated water management bus tour of Ballarat and surrounding areas. Bringing together over 30 people from local councils, water corporations, catchment management authorities, consultancies, and academia, the tour visited several projects that demonstrated collaborative planning and delivery of integrated water management. Ballarat West Employment Zone – Stephen Carter from Central Highlands Water shared insights into sustainable water supply options through the purple pipe network and future opportunities for aquifer recharge at this major employment precinct. 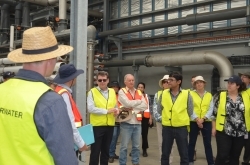 Ballarat North Water Reclamation Plant – the tour conducted by David Both from Veolia highlighted the plant's contribution to sustainable water supply by providing Class A recycled water and an alternative water network. Treated water from the plant sustains water levels in Lake Wendouree, and supplies water for industrial use and irrigation of sports fields. Lake Wendouree – Bernard Blood from the City of Ballarat emphasised the Lake's importance as a major social and recreational destination in the centre of Ballarat and how severely the community was impacted by the millennium drought. 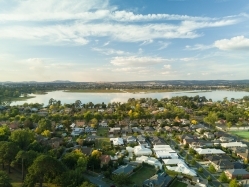 The lake’s future water supply has been safeguarded through supply from a stormwater harvesting project and additional treated water inputs from the Ballarat North Water Reclamation Plant. At the height of the millennium drought, Ballarat was a city in water crisis struggling to maintain its basic drinking water needs. Through a series of collaborative projects and initiatives, Central Highlands Water has generated long term plans with partners across the region to develop a clear vision for the future. This tour highlighted the challenges, key learnings and major projects that helped shift Ballarat from reactive measures in times of water scarcity, to today’s strategic initiatives that are working to ensure a water secure future for the region. Thank you to all who attended, the engaging speakers, and John Frdelja and Glenys Foy at Central Highlands Water. Note: Clearwater will be delivering a series of Masterclasses to further explore best practice in Integrated Water Management. Visit our training and events page to find out more and to register.